RepMail credits enable you to send outreach messages to reps, so you can see if they're interested in your product. 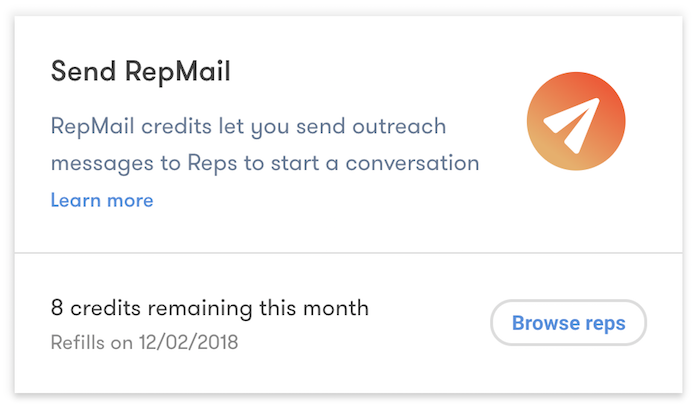 You receive a specific number of RepMail credits based on your subscription plan and can see how many credits you have available on your messages page. RepMail credits renew monthly, from the date you subscribed to a paid plan, and do not carry over. For example, if you subscribe to a paid plan on January 5 and have 10 credits available, then you use 5 RepMail credits, on February 5, your RepMail credits will be reset to 10 available credits. When are RepMail credits used? RepMail credits are only used for sending outreach messages to reps who have not previously messaged you. If a rep messages you first, or responds to your outreach message, you may then message freely without using RepMail credits.